For Fun: Some dogs just love swimming. Let your dog swim in a controlled environment while you keep him going with toys. You stay warm, and your dog gets a great workout. For Wellness: Gentle physical stimulation and exercise can keep your elder or physically challenged dog healthy and comfortable, keeping muscles strong and essential body systems running smoothly. 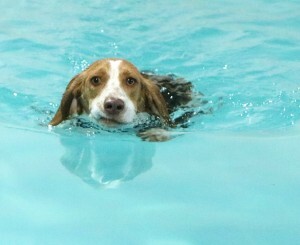 For Weight Loss: Swimming is an ideal exercise for pudgy pooches. It’s a safe, low-impact way to burn calories and build muscle mass. 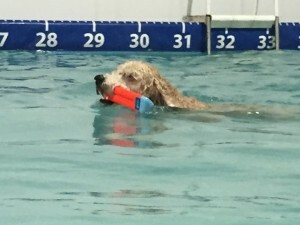 For Conditioning: Warm water swimming is the perfect solution for conditioning the canine athlete. Swimming is a very efficient whole-body exercise. With the water providing resistance, a five-minute swim is equivalent to about a five-mile run. 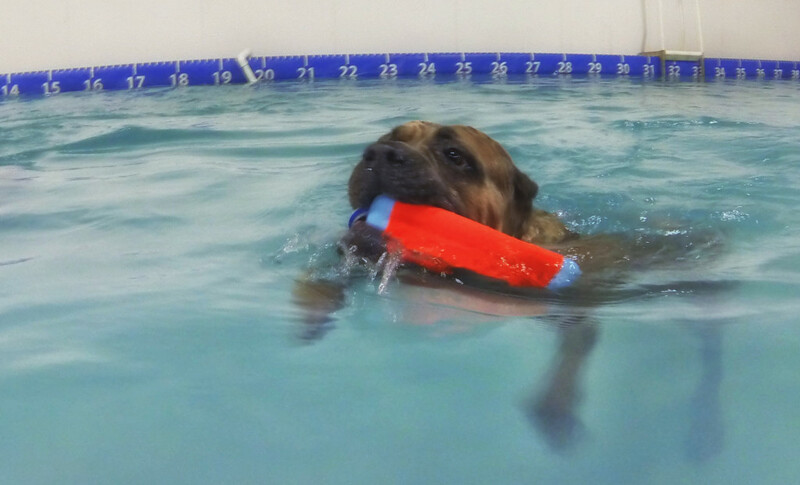 A challenging but low-impact workout, swimming keeps your dog in peak condition for trials while sparing joints. Sometimes our canine friends need a little assistance in the pool. 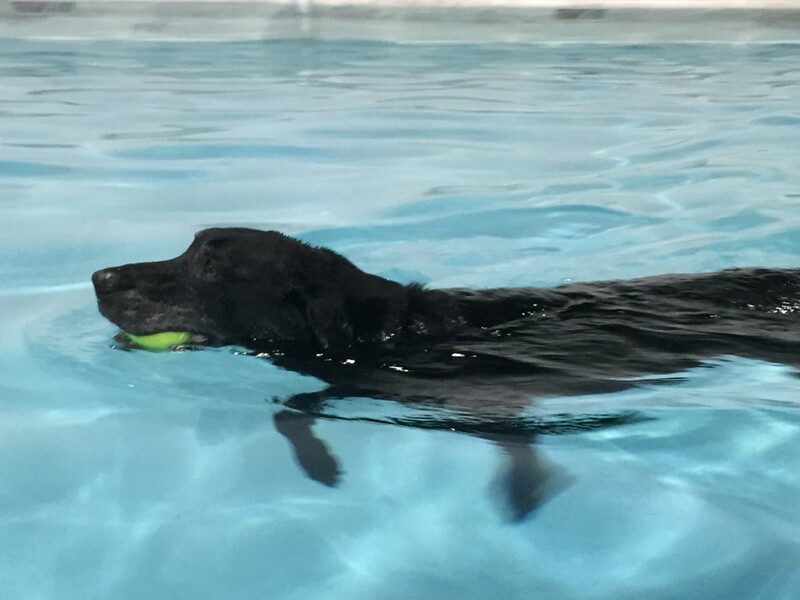 A canine swim coach will work in the water with your dog with swimming, feeling comfortable and confident in the water to enjoy his/her swim session. If your dog has never been swimming, a swim coach can safely introduce your dog to water to make his/her experience in the water as enjoyable and positive as possible. We also have a variety of life vests in case your dog needs just a little more help. New clients must first undergo a Pool Orientation. We will cover information about the facility and the rules for participating in activities to ensure the safety of all our clients and their dogs. We ask that you arrive 15 minutes before your scheduled orientation to fill out a client intake form. The majority of the pool orientation will be spent with your dog in the pool and making sure that your dog can safely enter and exit the pool. The session will last one half hour. 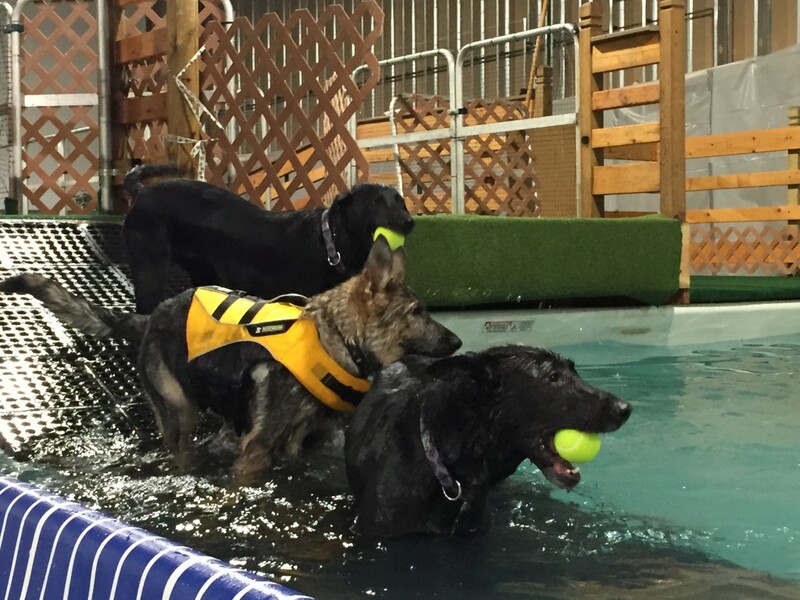 The maximum number of dogs that can participate in a single pool orientation is two from the same household. After your pool orientation, you are welcomed to book a private-swim session for your dog any time during our operating hours. Feeding: We recommend that you do not feed your dog several hours before and after his/her swim session. Vaccinations & Health: For the safety of all our clients’ dogs, we require all dogs to be vaccinated (or titered) for rabies and distemper. We also recommend a bordatella vaccination. Please bring a copy of your dog’s current vaccination records or have your vet email them to us. Only healthy dogs are allowed to use the pool. If your dog is not feeling well, please call to reschedule your pool time. Leashes: Dogs must be leashed at all times while outside or in the lobby of the facility. We recommend a 4’ or shorter leash and do not allow retractable or flexi leashes for safety reasons. Bathroom breaks: Before allowing your dog to swim, please give him/her a chance to go to the bathroom either in the parking lot area or in our fenced-in “back-yard” area located behind the facility. The physical activity and natural water consumption during swimming tends to increase a dog’s need to go to the bathroom. During swimming, we encourage bathroom breaks about every 15 minutes to avoid accidents. **Each additional dog over 2 dogs is $10 per dog. The maximum number of dogs per session is 4 dogs. 30 minutes: $45 for up to 2 dogs. 60 minutes: $90 for up to 2 dogs. All of our swim sessions are private. We currently do not offer “open-swim” sessions. Please refer to the “Pricing” tab for the limit and pricing on the number of dogs per session.